The igPercentEditor control allows you to provide full support for displaying and reading percentage values in user input. Further information regarding the classes, options, events, methods and themes of this API are available under the associated tabs above. 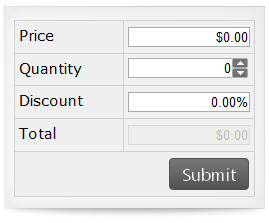 The igPercentEditor control extends the functionality of the igNumericEditor. For more details on the igPercentEditor control’s API, refer to the base igNumericEditor and igEditor control’s API documentation. The following code snippet demonstrates how to initialize the igPercentEditor control. Sets gets the factor which used for the get and set of the "value" method. On the get number (string) entered by user is divided by that factor and on the set the number (string) displayed in editor is multiplied by that factor. For example, if factor is 100 and the "value" is set to 0.123, then editor will show string "12.3". Possible values: 1, 10, 100, 1000, 10000, 100000, etc.